Latin American leaders have strongly defended the world’s most impoverished migrants after US President Donald Trump reportedly referred to certain developing nations as “shithole countries”. Bolivian President Evo Morales expressed his indignation on Twitter: “To insult African countries, El Salvador and Haiti, Trump insults the world and demonstrates his opinions and politics are contaminated by capitalist racism, fascism, arrogance, and ignorance. Hurricane Irma has just passed through the Caribbean, in a procession of tragedies that have destroyed lives and left material damage behind. In response to this natural disaster, Venezuelan President Nicolas Maduro sent humanitarian aid to Cuba, Antigua and Barbuda (with 95% of buildings in Barbuda destroyed), and the French colony of Saint Martin on September 10. French Guiana, in South America, and the French West Indies, in the Caribbean, could join the anti-imperialist Bolivarian Alliance for the People’s of Our America (ALBA), if left-wing candidate Jean-Luc Melenchon were to win France’s presidential election. ALBA was founded by Venezuela and Cuba in 2004 as an alternative to neoliberal free trade agreements, and now includes 11 Latin American and Caribbean nations. Venezuelan President Nicolas Maduro voiced solidarity with the Greek government of Alexis Tsipras on June 30 after Greece failed to pay US$1.8 billion to the International Monetary Fund (IMF), Venezuelanalysis.com said on July 1. “I want to officially express solidarity to Prime Minister Tsipras and the Greek people on behalf of Venezuela,” Venezuela's socialist leader said on his weekly television program shortly after the IMF deadline. Emergency summits of the Organisation of American States (OAS), the Union of South American Nations (UNASUR) and the Bolivarian Alliance of Our Americas (ALBA) have rejected US attacks on Venezuela and offered the South American nation support. TeleSUR English reported that a large majority of delegates at an emergency OAS meeting expressed concern about US President Barack Obama's March 9 “executive order” declaring Venezuela a threat and “national emergency”. The Bolivarian Alliance of the Peoples of Our America (ALBA) is an anti-imperialist trading bloc first formed by the left-wing governments of Venezuela and Cuba to promote trade on the basis of solidarity rather than competition. It has since expanded to include Bolivia, Ecuador, Nicaragua, Dominica, Antigua and Barbuda, St Vincent and the Grenadines, Saint Lucia, Grenada and Saint Kitts and Nevis. Honduras was an ALBA member, but was forced to withdraw when a 2009 US-backed coup installed a right-wing dictatorship. 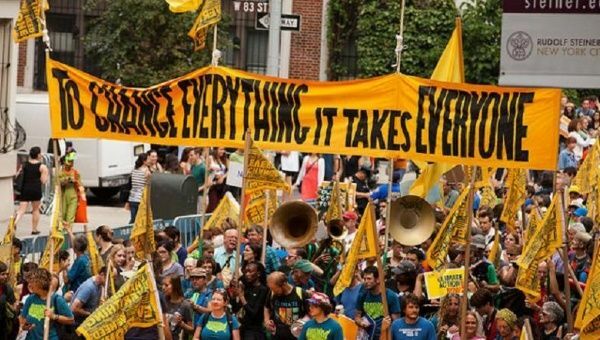 From January 24-29, the Brazilian city of Porto Alegre was again the staging ground for the World Social Forum (WSF), an annual international gathering of anti-globalisation and anti-capitalist activists. Among the various movements present, one of the most visible was Brazil's Movement of Landless Rural Workers (MST), possibly the largest social movement in Latin America. Seven years after being launched by the Venezuelan and Cuban governments, the Bolivarian Alliance for the Peoples of Our Americas (ALBA) has become an important voice on the global stage willing to stand up and denounce capitalism. ALBA has grown to include eight Latin American and Caribbean countries (Venezuela, Cuba, Bolivia, Ecuador, Nicaragua, Antigua and Barbuda, Dominica, Saint Vincent and the Grenadines.